Growing up in L.A., I was a very popular child. Sadly, I have come to realize that perhaps my popularity had more to do with the fact that we had a swimming pool than my rapier like wit or dashing good looks. 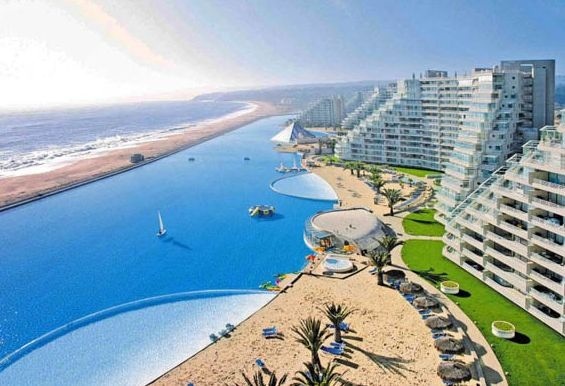 Mind you, our pool wasn’t quite as big as the pool above, which allegedly is the largest pool in the world. 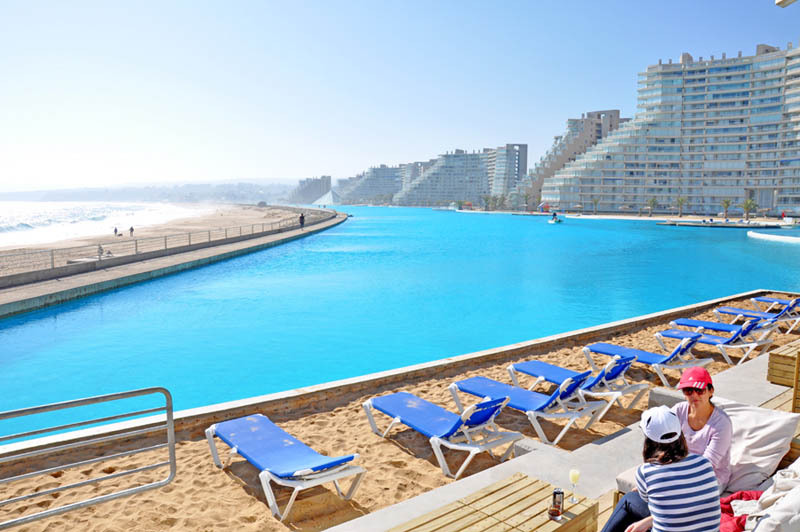 The pool is located next to the swanky San Alfonso del Mar resort in Chile. It is more than 1,000 yards long, covers 20 acres, has a 115-foot deep end, and holds 66 million gallons of water. It took five years to build, cost nearly $1 billion, and the annual maintenance bill will be $2 million. It recirculates sea water. I have to admit, the pool is pretty impressive. 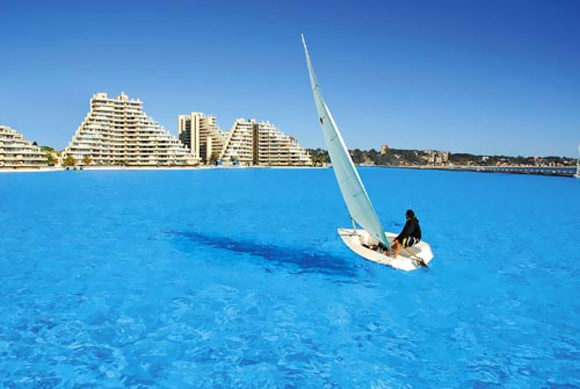 You wouldn’t want to go swimming in such a pool unless you had a really amazing bathing suit. Luckily, a young woman in New York City, Caitlin Kelly, is up to the task of producing such a bathing suit. Ms. Kelly is designing some rather splendid bathing suits. But what I want to thank Ms. Kelly for is her decision to have her bathing suits made by members of our extended American family working in the Big Apple. 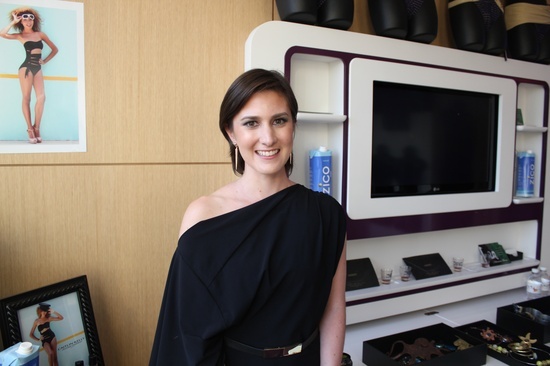 Several of Ms. Kelly’s bathing suits are featured in the upcoming Sports Illustrated Swimsuit edition. One, worn by Kate Upton, barely meets the definition of a bathing suit, but I am somewhat of a traditionalist when it comes to swimwear. So a huge “Way to Go” is in order for Ms. Kelly for her decision to make her swimwear right here in the U.S. rather than in the Middle Kingdom or some other steamy locale. Though I have heard that NYC can get somewhat steamy in the month of August most years. If you lack air conditioning. And you live in Brooklyn or Queens. I’ve heard it never gets hot in the Upper East Side. This entry was posted in american made, Apparel, Made in America, made in usa, recreation and tagged Big Apple, Caitlin Kelly bathingsuits, Kate Upton, Made in America bathing suits, Made in US bathing suits, Sports Illustrated Swimsuit Issue, Swimming pool, Swimsuit, Upper East Side. Bookmark the permalink.